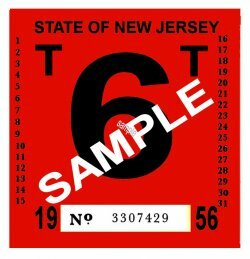 00 New Jersey FAILED REJECTION Sticker 1950s - $20.00 : Bob Hoyts Classic Inspection Stickers, Add a Final Touch to your Restoration! It was used until 1960 when the newer sticker that resembles a stop sign was introduced. The T shown on the sticker was "TEMPORARY" and the owner had 21 days to have the car repaired and re-inspected. Available in any other month/year for additional $5.00. You own QQ License plate number can be ordered for this sticker for an additional $10.